Nowadays, ametropia can be corrected in up to high diopter ranges thanks to refractive operation techniques. 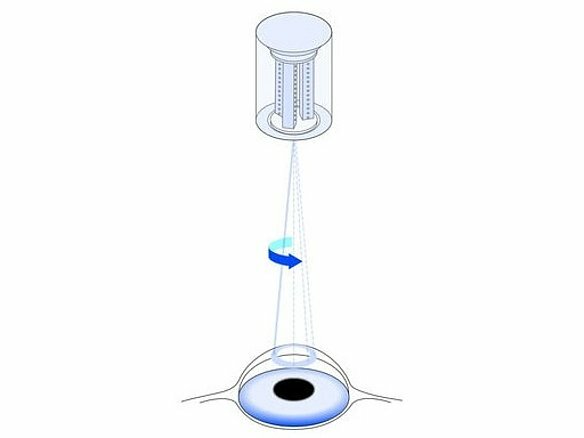 In ophthalmology, the shape of the cornea is modeled in the optical axis by removing corneal tissue with laser beams so that the resulting refractive power of the cornea matches the length of the eyeball again. The laser beam control and focusing requires high-precision positioning systems. Ceramic PILine® ultrasonic motors are characterized by extremely high velocities and acceleration while having very compact dimensions. For laser beam control, piezo-driven tip/tilt mirror systems not only offer the required accuracy but high accelerations and a great dynamic bandwidth of over 100 Hz as well. They are compact and can be integrated in higher-level systems, even in small spaces. They allow an optical deflection angle of up to 6°, extremely fast response behavior (10 ms to 1 ms with mirror) as well as position resolutions into the nanoradian range. In the case of tip/tilt mirror systems with several motion axes, piezo drives are used in parallel-kinematics positioning systems. Unlike serial systems, there is only one moving platform with a common pivot point. Integrated high-resolution position sensors ensure linearity values of better than 0.25% over the full travel range and a repeatability of typically 5 µrad.